Santos Saul Alvarez Barragan, better known as Saúl Álvarez, was born on 18 July 1990, in Guadalajara, Jalisco Mexico, to parents Ana Maria Barragan and Santos Alvarez. He is a professional boxer, known for holding the WBA and WBC Light Middleweight and Middleweight titles. A famous boxer, how rich is Canelo Alvarez? According to sources, Alvarez has earned a net worth of over $25 million, as of early 2016; he ranked #66 of the world’s highest-paid athletes on Forbes 2014 list, his wealth having been established during his boxing career. When he was five years old, his family – including six brothers, also boxers – moved from San Augustin de Tlajomulco de Zuniga to Juanacatlan, Jalisco. 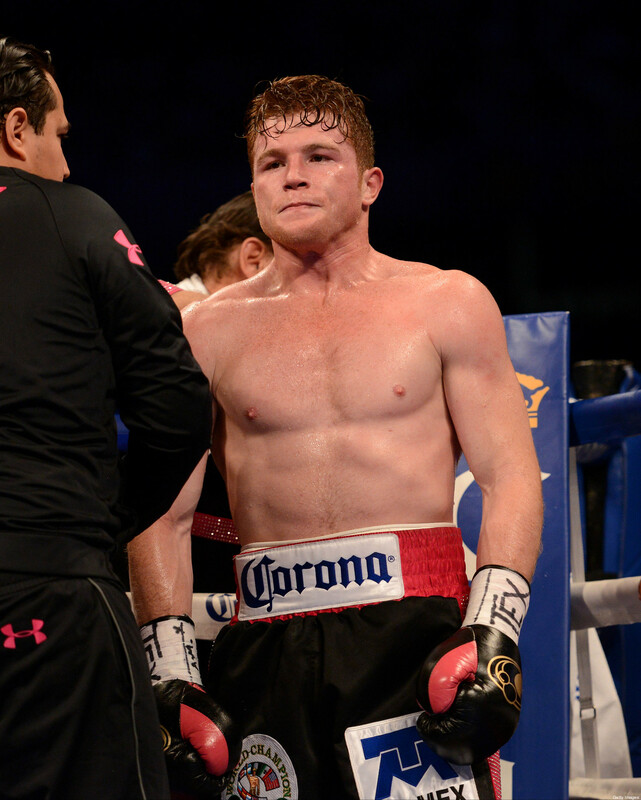 Alvarez began boxing at the age of 13, largely because he was teased by his peers for having red hair and freckles. He was inspired by his older brother Rigoberto who eventually held an interim world title at junior middleweight in 2010. In 2004 the young Mexican became the silver medalist at the Junior Mexican National championships in Sinaloa, and the gold medalist at the Junior Mexican National Championships in Chiapas the following year. After a brief amateur career, he dropped out of high school and began boxing professionally in 2005, being trained by father-and-son team Chepo and Eddy Reynoso – he knocked out 30 of his first 42 opponents, which included his win against the current IBF Lightweight Champion Miguel Vazquez in 2006, and again in a rematch in 2008, with his six brothers all fighting at that event. He then defeated Brian Camechis and Jose Miguel Cotto in 2010, when earned him the NABF Welterweight title. His net worth was rising steadily. The same year he signed with the Golden Boy roster and went on to win the WBC Silver Light Middleweight title in a fight against Luciano Leonel Cuello. Afterwards, he knocked out Carlos Baldomir with a single punch, becoming the first boxer to knock Baldomir out and only the second one to stop him. He went on to win the WBC Light Middleweight title in a win over EBU Welterweight Champion Matthew Hatton in 2011, becoming the youngest boxer ever to hold a version of the world super-welterweight title, aged 20. His success greatly contributed to his net worth. Alvarez defended his title in a win over a Super Welterweight and current EBU Light Middleweight Champion Ryan Rhodes, then over The Contender competitor Alfonso Gomez and a former Welterweight Champion Kermit Cintron. In 2012 he defended his title against Shane Mosley and later Josesito Lopez, staying undefeated with a record of 41-0. By defeating Austin Trout in 2013, Alvarez retained his WBC light middleweight title, and won the WBA and The Ring Magazine Light Middleweight title. What followed was the fight against The Ring Magazine’s no. 1 pound for pound fighter, WBA Super Welterweight Champion and WBC/The Ring Magazine Welterweight Champion Floyd Mayweather Jr., in which Alvarez was defeated, losing his WBC and The Ring light middleweight titles; however, the fight earned him $12 million. He went on to beat Alfredo Angulo, adding $7.5 million to his net worth. He defeated Erislandy Lara in 2014 and James Kirkland in 2015 in non-title matches, and with the win against Miguel Cotto in 2015, Alvarez won The Ring, lineal and vacant WBC middleweight titles and added over $7 million to his wealth – the WBC later awarded him its Diamond Middleweight title. Alvarez retained his titles in a win over Amir Khan in mid-2016. Reportedly, the fight grossed over $7 million, being one of the best in Nevada history, adding more than $6.5 million to Alvarez’s wealth. Alvarez then announced a future fight against the middleweight champion Gennady “GGG” Golovkin. He has recently announced that he has vacated his WBC title, as he doesn’t want to be pressured into the fight with Golovkin by an ‘artificial deadline’. The WBC awarded the title to Golovkin and it remains to be seen to which one of the boxers it will actually go to. Speaking of his personal life, Alvarez has one daughter with his ex-girlfriend. In 2010 he was briefly engaged to Marisol Gonzales, a TV sports reporter and the 2003 Miss Mexico Universe. Sources believe he is single at present. Alvarez is an avid horse rider. He was gifted two horses, one by Mexican pop star Vicente Fernandez and the other from the local mayor.